November is a great month. 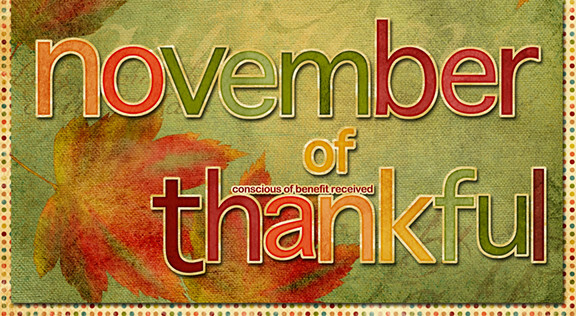 It’s the beginning of the holiday season starting with Thanksgiving; what a great way to start things off by being thankful. One of my friends from college started 30 Days of Thankful on her Facebook page. I thought it was a great idea and participated throughout the month. Some of my thankfuls are specific to what was going on for that day, some are not. Many friends commented to me how much they liked my “thankfuls”, so I thought I’d share them with you. Day 1: I am thankful that my family is healthy. There are so many families that have major health issues (and costs) and spend so much time in hospitals/doctor’s offices worrying about their health. Day 2: I am thankful that I have the right to vote. Day 3: I am thankful that I can stay home and raise my kids. It always seemed like an impossible dream before. I am so happy that I can be home with my baby and be home for my bigger kids right after school. Day 4: I am thankful for kids that got up and ready for school today without having to be nagged. And, that they actually let me take a shower before the baby woke up. Day 5: I am thankful for my MOPS group. They help me get out of the house and enjoy the company of others. They are a great group of women! Day 6: I am thankful that Baby E is a good sleeper and sleeps though the night. I don’t do well without sleep. Day 7: I am thankful for my extended family. They are all wonderful! Day 8: I am thankful for my husband. He knows me better than anyone else in the world. He is a wonderful father and spoils me. Just today he made me a yummy omelet for breakfast and watched Baby E while I took a nap – on his day off. Day 9: I am thankful for my little cutie, Baby E. Today is his official 1 year birthday! Day 10: I am thankful for flannel sheets. They are so warm and cozy! I finally slept without shivering last night! Day 11: I am thankful for all the men and women who have, are, or will serve our country so that we can enjoy our freedoms. Day 12: I am thankful for scrapbooking days out with the gals. As much as I love my family, mommy needs a day out every once and a while. Can’t wait for scrapping tonight! Day 13: I am thankful for my friends. They help bring my stress levels down and laugh! Thank you guys! Day 16: I am thankful that the night of Baby E screaming in pain is over. I hope he feels better quick. Day 18: I am thankful for giggles and smiles from my two boys that played together for a long time this afternoon. Day 20: I am thankful for time with just my daughter. We had a great time doing pedicures and watching Harry Potter 6 (with no interruptions from the boys). Day 21: I am thankful for having food to eat. So many people go without. Day 22: I am thankful for quiet days (when baby is napping) where I can get important things accomplished. Day 23: I am thankful for a patient and generous husband. He picked up A from school, went shopping (with the baby), and made dinner yesterday. All so I could finish our 2009 digital scrapbook and use my coupon for a free book and free shipping before it expired. I was pretty checked out on the computer most of the day. Day 25: I am thankful for safe trips, good food and family. I hope everyone had a great Thanksgiving! Day 26: I am thankful for Baby E falling asleep in the car on the way home from up north. It would have been a LONG and stressful drive if he stayed awake and cried and screamed the whole way home. Day 28: I am thankful for my daughter A. She is sweet, smart and pretty. She is creative, loves all living things and wants to make the world a better place. She is my first baby and has changed my life forever. She reminds me to not get worked up over small things. I love you, A! Day 29: I am thankful for my son G. He’s quirky, funny and very observant. He is a builder and likes to figure out how things work. He is my first boy and has taught me that life can be frustrating for people who like things orderly (like me) but that we look pretty funny when we get stressed out about it. I love you, G! Day 30: I am thankful for my son Baby E. He’s full of personality and generally a happy, smiley baby. He loves to discover new things and destroy any order and organization that may exist anywhere. We are so blessed that he’s part of our family and I’m so happy that I get to spend every day, all day with him and watch him grow. I love you, Baby E! Image Credits: I created November of Thankful with the Early Fall Collection Mini by Trish Yochum. You can purchase the collection in the Scrap Girls Boutique – and it’s on sale right now!